India is set to become the world’s third-largest Construction Market by 2025 and thereby the sector is a key driver for the Indian Economy. The construction sector in India contributes to 11% of the total GDP and currently employs about 50 million people which is second only to agriculture sector in the country. With the ever-increasing growth of the sector in India, the employment and investment opportunities are also picking up pace substantially. With space available in the private as well as public domain, the Construction industry in value terms is expected to record a CAGR of 15.7% to reach $ 738.5 bn by 2022. The Construction industry in India includes broadly the Real estate and the Urban development segment. The Real estate segment covers residential, office, retail, hotels and leisure parks, etc while the urban development segment mainly consists of divisions such as Water supply, Sanitation, Urban transport, Schools, and Healthcare. The recent spur in-terms of the robust tidings in the construction sector are due to the recent reforms, development plans, initiatives, etc. that had been long overdue for decades now. Construction sector in India has been highly unorganized and therefore it was very difficult to track and monitor the size, revenue, growth, and drivers of the sector. Introduction of RERA has brought most of the builders and developers under its umbrella, which makes it mandatory for all commercial and residential real estate projects where the land is over 500 square meters, or eight apartments, to register with the Real Estate Regulatory Authority (RERA) for launching a project, in order to provide greater transparency in project-marketing and execution. RERA aims to create a more even-handed and just business between the seller and the consumer, especially in the primary market. RERA, it is hoped, will make real estate market simpler, by implementing better accountability. The RERA has given the Indian real estate sector its first major regulator and it is expected that this would be a win-win for both the buyers and the sellers. Goods and Services Tax (GST) is another major reform that has helped the stakeholders escape the clutches of multiple and unfair taxes which were a major turn off for business houses. GST for most of the construction-related commodities has been recently reviewed and reduced adding to the morale of the sector. By and large, GST is likely to help fetch a lot of necessary clearness and liability. Moreover, due to the expected liberated flow of credit, builders should be able to benefit from an increase in overall margin. Looking from the consumer point of view, the one primary advantage would be in terms of decrease in the overall tax burden on goods and increased transparency in the tax system. One thing for sure is, the impact of GST will be felt albeit after a while. India, for the first time ever, has become the top 100th nation in terms of Ease of Doing Business, jumping 30 positions from last years’ position of 130. The rankings come in the backdrop of World Bank’s report on Reforms to create jobs. The World Bank has ascribed the major jump in the ratings to the recent business reforms taken up by the government. India’s capability to lever insolvency cases has enhanced from 136th position last year to 103 this year. World Bank has also acknowledged the reforms made in 8 out of 10 Doing business indicators. India is fast becoming a preferred place for global investors to do business. The report also places India at the 4th place in terms of Protecting Minority Investors globally. The time needed to register a new business has been reduced to 30 days now compared to a mammoth time of 127 days fifteen years ago. This would most definitely prompt new businesses to set up shop with the support of both foreign and domestic investment and thereby create job opportunities for youth. 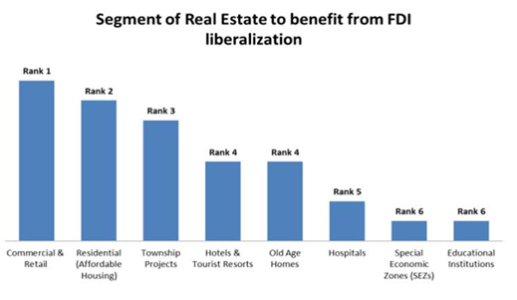 In January 2018, the central government approved 100 percent FDI in the construction development segment (housing, real-estate, booking services, etc.) via the automatic route. As a result, India will open up as a global retail market with experts predicting robust real estate supply. It will bring more investment, transparency, and governance in the sector. FDI has already prompted investments from private investors from U.S, China & Japan like Softbank, Multiplex, CPPIB, etc. According to Cushman & Wakefield, the real estate sector has got investments worth Rs.30,000 Cr. till March. Most of the foreign investment has gone into the commercial real estate and infrastructure. With the future of FDI being predicted as stout, there is a good chance for the civil engineering & allied professionals to enter the forays of the construction sector with opening up of new projects. The Smart Cities Mission is a ground-breaking initiative by the Government of India to propel fiscal growth and recover the quality of life of people by enabling local growth and yoking up technology as a means to construct smart outcomes for the populace. The smart city project mission programme envisions the development of 100 cities under a pilot programme wherein urban renewal and retrofitting of the select cities will be taken up by the Government of India along with the state government with a mission to develop 100 cities sustainable. A total of US $15 billion has been earmarked by the Indian Cabinet for development of 100 smart cities. There are different phases in the selection of smart cities: Intra-state competition is the first level of selection where state governments were supposed to shortlist potential smart cities according to the criteria of MoUD(Ministry of Urban Development). The next stage required each of potential smart city to prepare a proposal, for which then evolution was done by a panel of experts where selected cities were declared as Round 1 smart cities. The selected cities will prepare SPV (special purpose vehicle) & start implementation of SCP ( smart city proposal). The manpower need for the development of smart cities is huge and there are immense opportunities for engineering & allied professionals in this sphere. Pradhan Mantri Awas Yojna or Housing for all has been launched by the GOI to improve the housing conditions for the urban poor by 2022. The first approach examined is beneficiary led construction (BLC), where households with a land, or a house, can claim a subsidy of Rs 1.5 lakh for construction or an extension. Benefits include better living quarters, health and opportunity for a family to live together. The next approach is the affordable housing in partnership (AHP) scheme, where projects are taken up as the public-private partnership (PPPs). 35% of houses are to be retained for the economically weaker sections. The last scheme is in-situ slum redevelopment (ISSR). This barters the land presently covered by slums and engrosses re-housing slum dwellers in better lodgings in the same place, with the partaking of private developers. This again is along the path of creating employment opportunities for job seekers and will surely benefit the economic panorama as a whole.